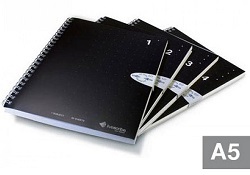 The convenient A5 size notebook has 80 college-ruled perforated sheets. Slide one into your Smartpen Portfolio, and they’re perfect for meetings or classes. Works with all Livescribe smartpens. Does not contain page controls for optimized use with Livescribe 3 smartpens (see A5 Single Subject Notebook, 4-pk (#1-4), Livescribe 3 Page controls).